Spoonful Of Comfort is a Utah-based meal delivery company that delivers just what its name says – a little bit of comfort for your loved ones when they are feeling under the weather or simply need warmth, love, and support in the form of the world’s greatest comfort food – chicken soup. This simple concept has conquered the hearts of millions of soup-lovers across the nation. Spoonful Of Comfort has been delivering soul-warming soups for a whole decade and judging by its popularity, it is here to stay. In this Spoonful Of Comfort review, we’ll try to discover what makes this company’s soups so delightfully special. Ordering from Spoonful Of Comfort is perfectly simple and only takes a couple of clicks. First, you get to decide what type of gift you want to send. Although Spoonful of Comfort primarily specializes in soups, it offers cookies as well. You can choose to send soup, cookies or both. There are 6 kinds of soups and 4 cookie types at your disposal. You can either shop by soup or cookie type or by occasion, including Just Because, Thinking of You, Get Well, New Parent, Sympathy, Away From Home, and Corporate. If you want to make your gift more special, you can opt for a comforting or pampering accessory. These include such thoughtful gifts like comfy, motivational socks and soothing tea. Once you are done choosing your soups, cookies, and accessories, you can simply proceed to checkout, fill in the delivery details, and voila! The ultimate comforting gift is on its way to your loved one. Spoonful Of Comfort gift packages contain 64-oz. 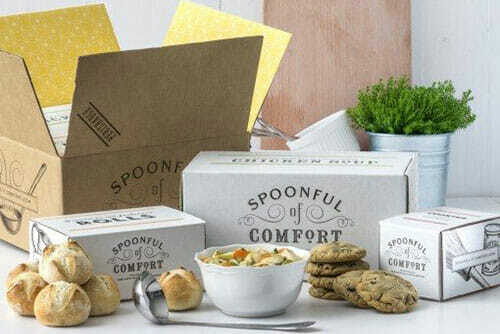 (4-6 servings) of the soup of your choice, half a dozen of Bacci rolls, half a dozen of cookies of your choice, a special ladle, and a personalized note, all wrapped in gorgeous custom packaging. Spoonful Of Comfort is simply unique in every way. It is a meal delivery service that delivers more than just meals. 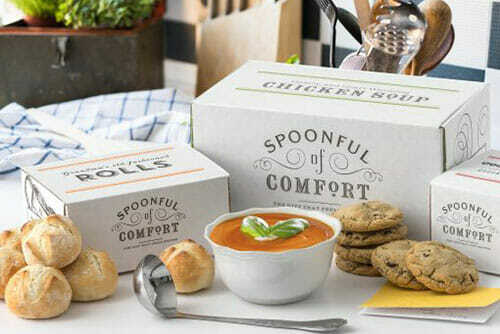 Its soups and cookies are crafted with care, beautifully packaged, and designed to provide comfort at times when it is most needed. 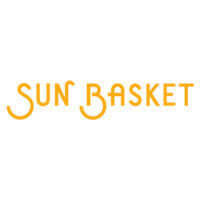 The service offers gift baskets for all kinds of occasions, so you can easily find a perfect gift for a friend, business partner or loved one. 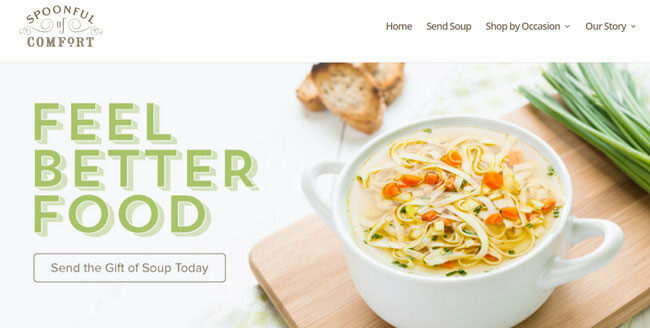 The company’s almost exclusive focus on soups is one of its most prominent features. Its assortment is not vast, but each of its products is carefully crafted to be comforting, delicious, and thoughtful. 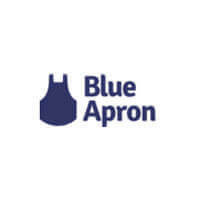 The company does not plan on introducing other meal types, like lunches and dinners, as a part of its charm lies in the fact that it focuses on what it does best – delivering soups that nourish both body and soul. Although Spoonful Of Comfort does not offer a great range of options for special diets, it does provide nut-free, gluten-free, and vegetarian options. It is currently working on becoming kosher certified. Finally, it is important to note that Spoonful Of Comfort offers a 100% satisfaction guarantee. If you are not happy with your gift, you should get in touch with its friendly staff and they will do their best to make it right. Previously in this Spoonful Of Comfort review, we stated that the company offers 6 soup types and 4 cookie types. Now it is time to say a bit more about each product in its offer. At the moment, the service offers chicken noodle, butternut squash, tomato, cheddar broccoli, corn and potato chowder, and vegetable soups. Chicken noodle soup is its most famous soup. It is rich in vitamins and antioxidants and made of seasoned, roasted chicken, fresh thyme and parsley, and a whole lot of noodles. Butternut squash soup is a perfect choice for cold winter days, but it tastes amazing in the summer as well. Just like chicken noodle soup, it contains plenty of vitamins and antioxidants. It is made of gorgeous butternut squash, warm holiday spices, a splash of cream, and maple syrup for some delicate sweetness. Tomato soup is a soup for all seasons. It is rich, piquant, and made of delicious, fresh tomatoes, basil pesto, and gorgeous asiago and parmesan cheeses. Cheddar broccoli soup is creamy, healthy, and beaming with flavor. It features a butter base for extra creaminess, chicken broth for richer flavor, cheddar for some exciting sharpness, and plenty of vitamin-rich broccoli and carrots. The addition of rosemary, turmeric, and smoky paprika further boosts the flavor of this lovely soup. If you want a perfectly comforting and filling soup, corn and potato chowder soup is the way to go. It contains a whole lot of potatoes, sweet summer corn, butter sautéed celery, onions, peppers, herbs, and a generous sprinkle of bacon crumbles. Finally, the wonderfully healthy vegetable soup features some juicy, ripe tomatoes, carrots, corn, squash, celery, and a bunch of fresh herbs that make it extra fragrant and delicious. The shelf life of the company’s soups is 3-5 days in the fridge. If you want to save some for later, you can place it in the freezer, preferably as soon as you receive it. Now, let us take a look at the cookies. You can opt for chocolate chip, oatmeal raisin, snickerdoodle, and good ol’ sugar cookies. As you can see, all of the cookies are well-known classics that need no special introduction. Like we said before, the service offers gift baskets for a multitude of occasions. Around holidays, it offers additional holiday gift baskets, like Mother’s Day soup packages. As far as specialized gifts for special diets are concerned, at the moment, you can get the gluten-free package or create a nut-free or vegetarian package by selecting veggie or nutless soups and cookies. The soup and cookie gifts start at $69.99. If you want just soups, sans cookies, you pay $59.99. Just-cookie packages start at $24.99 (1 dozen) and go up to $39.99 (2 dozen cookies). Thoughtful accessories, including bandana boy bib set, Because You’re The Absolute Best book, calming tea, bath tea, blanket embrace, raw honey & dipper, pure goat milk hand cream, pure goat milk lip balm, and Keep Your Head Up socks, range from just $5 (tea/honey) to $49.99 (blanket embrace). The shipping fee depends on the shipping option you choose. With 2-3 day standard shipping, you pay a $14.99 shipping fee per delivery. With 2 day shipping, the shipping fee amounts to $39.99 per delivery. Finally, with overnight shipping, you pay a $49.99 shipping fee per delivery. The great news is that Spoonful Of Comfort ships to all addresses in all 50 US states. If you place your order before 1 pm Mountain Time on Monday, Tuesday, Wednesday, Thursday or Friday, your delivery is shipped the same day. If you opt for standard shipping, you can expect your delivery to arrive in 2 (Western US) or 2-3 days (Eastern US). The packages are shipped via FedEx and USPS Priority Mail. No signature is required, so the recipient does not have to be at home to receive the delivery. To make sure Spoonful of Comfort meets all your standards and expectations, it is important to know its biggest advantages and disadvantages. 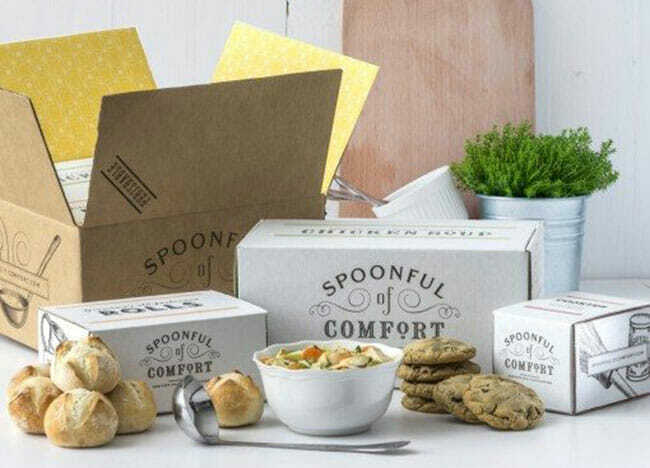 With a short overview of its pros and cons, you can easily decide if Spoonful of Comfort is the right meal delivery service for you. With Spoonful of Comfort, you get delicious meals prepared by pro chefs at affordable prices. To find out what kinds of delights you will receive in your delivery, we have chosen a couple of sample dishes that accurately represents its offer and can help you decide if it is the right service for you. If you love soup and know someone who loves it too, Spoonful Of Comfort is a service that is definitely worth your attention. 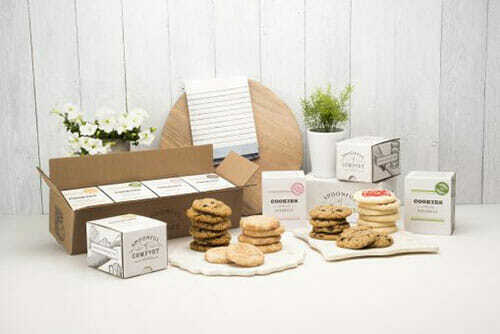 Its soups and cookies are truly unique and made with love, they are gorgeously wrapped, and every delivery includes a couple of nice bonuses to look forward to. The prices are ok and the packages come with a satisfaction guarantee. All products are designed as gifts, but there is no reason why you could not get a spoonful of comfort for yourself as well. Our ratings are the result of an objective and independent evaluation of Spoonful of Comfort, generating the final rating that reflects the overall quality of the company. Ratings may change as the service changes. Spoonful of Comfort customer rating based on 3 customer reviews. Packaging is really nice. However, I was not happy with delivery at all. It took 5 days for the soup to arrive and it was not cold. I called customer service and she stated that it really only took 3 days because they don't count Sundays or the day the ship it either. Huh?? It was shipped on Thursday and it arrived on Monday. That is 5 days. She literally wouldn't acknowledge what I said and stated that everything was as it should be and was perfect. The whole conversation was strange. So, I ate the cookies (they were good), and threw the soup in the trash. ....... Bottom line - don't ship perishable foods on Thurs or Fridays! Waste of money. Beautifully packaged, nice warm cozy comfort. Only complaint was that I couldn't twist off the kid on the soup container. I'm a pretty strong women and all my efforts to unscrew the lid yielded nothing. I finally had to hack open a big hole through the middle of the lid with a knife, then pour out the liquid and fork out the solids. Package sent to my wife after surgery by family members. We were very pleased with the chicken noodle soup, the rolls were excellent and the chocolate chip cookies were off the hook. We will be using your service again in the future..
We found 0 verified Spoonful of Comfort discounts for April, 2019. There are no Spoonful of Comfort coupons or discounts right now.